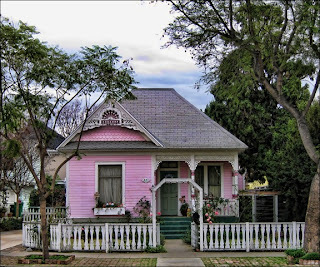 I passed a bright pink house today. I mean bright pink. Otherwise it looked like a regular ranch-style suburban number. Just, you know, owned by Bazooka Joe, I guess. Which gets me thinking, didn't John Mellencamp sing something about these? Little pink houses? If I remember correctly, it has something to do with low-income housing for poor, possibly black families. I thought the color had something to do with cheap insulation or siding, but it turns out John just drove past an old man sitting outside his pink shotgun house with his cat one day. So really, there's no good explanation for why this thing was bright pink. A house near my grandparents' place used to have one pink wall back in the seventies. One other was yellow and I think another brown or something. That has nothing to do with today, really. It was just the only other pink house I could think of. Until today, I mean, when I encountered this place I assume belonged to either the Easter Bunny, Barbie, or the heirs to the Pepto Bismol fortune. May The Force Bark With You! The Discover Card: For Hipsters Only? Can You Make a 'Human Centipede' from Mermaids? "It's Not Delivery, It's Far, Far Worse…"